Christmas is coming...which means it's time to pull out the green and red inks, and of course there should be some sparkle mixed in somewhere. I saw this picture and thought it had some great Christmas colors, so of course it had to become an ink palette. I started pulling out my swatches and going through them to match colors and realized that I don't have a ton of red or green inks reviewed. When I do ink palettes I always use inks I have already reviewed and can recommend, so here are the inks I like best for Christmas this year. 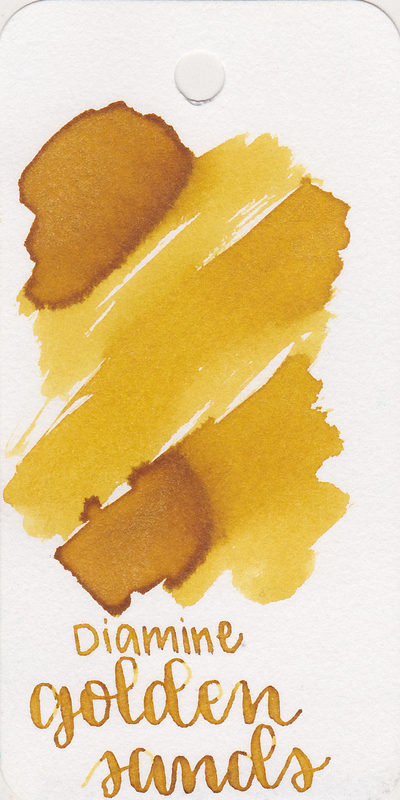 I really like this brown-it's on the red side of brown, but I think it looks good along side brighter inks. This is one of my favorite reds right now, nice and bright, with some great shading. Golden Sands is from the original Shimmertastic collection in 2015, but I've just got around to trying it this month. I really like it-it's perfect for Christmastime. If you want a gold without shimmer, Robert Oster Gold Antiqua would be a great choice as well. River of Fire is a great green for Christmas since it has a great red sheen, but if you want a little bit of a lighter green Robert Oster Peppermint is a great choice as well. I usually use this ink in the spring and summer but I think it works as a light Christmas green as well. I love mixing in a neutral or two with bright colors-it helps keep the collection from becoming overwhelming. So here's my question for you: what's your favorite ink to use at Christmas time? Let me know in the comments below.